Clan Anstruther is a Scottish clan from Anstruther in Fife, in the east of Scotland. Alexander I of Scotland granted the lands of Anstruther to William de Candela in the early 12th century. There are a number of suggested origins for William but research points to the Normans in Italy. It is known that William I of England sought assistance from William, Count of Candela, who sent his son. It is likely that this son was William de Candela, who received the grant of land from Alexander. 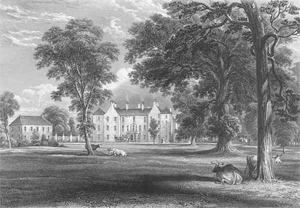 William de Candela's son, also William, was a benefactor to the monks of Balmerino Abbey. The site now occupied by the Scottish Fisheries Museum in Anstruther was a gift from William. The next generation of the family, Henry, no longer styled himself , de Candela, being described as 'Henricus de Aynstrother dominus ejusdem' in a charter confirming grants of land to Balmerino Abbey. Henry Anstruther accompanied Lois IX to the crusades and swore fealty to King Edward I of England in 1292 and again in 1296. In 1483, Andrew Anstruther of Anstruther confirmed the right to a barony and fought against the English at the Battle of Flodden Field in 1513. His second son, David, fought at the Battle of Pavia in 1520 in the service of Francis I of France in the French Scots Regiment. This line ended with the death of the last Baron d'Anstrude in 1928. 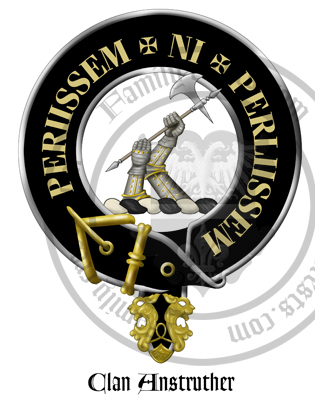 Andrew's great-great-grandson was chosen as a companion to the young James VI of Scotland, who appointed him Hereditary Grand Carver, a title still held by the head of the family today. In 1595 he became Master of the Household. His son, William, accompanied James to London following the Union of the Crowns in 1603 where he was made a Knight of the Order of the Bath. The next son Sir Phillip Anstruther led the Clan and fought as Royalists during the civil war and received Charles II at Dreel Castle after his coronation at Scone in 1651. However Phillip Anstruther was later taken prisoner after the Battle of Worcester in 1651. Current Clan Chief: The Chief of Clan Anstruther was Ian Anstruther of Anstruther, from 2002 to his death in 2007. Arms: Argent, three piles sable. Supporters: Two falcons with wings expanded proper, beaked and membered gules, belled and jessed or. Azure, a St Andrew's Cross Argent in the hoist and of two tracts Sable and Argent, upon which is depicted the Crest issuant from a coronet Or in the first compartment, two daggers in saltire Argent handled Sable environed of a crest coronet Or in the second compartment, and a sprig of olive slipped and leaved Proper in the third compartment, along with the Slogan 'Castle Dreel' in letters Argent upon two transverse bands Gules. From the town of Anstruther, which was adopted as a familial name. The Chief's seat remains at Balcaskie Castle. Airdrie House and Newark Castle in Fife also belong to the Anstruthers. Balcaskie House was acquired by the Anstruther family in 1698 and remains a family residence to this day.